With Visual Studio Team System (VSTS), Microsoft has made available an integrated set of tools which are used by members of the software development team. Each of these persons is going to play one or multiple roles. One can vary easily imagine roles of Business Analyst, Project Manager, Technology Solution Architect, Developer, tester and Release Manger. These roles use different tools which suit them. For example Developers over the years have used Visual Studio to create code and Project Managers use MS Project for creating, monitoring and controlling a project. All the tools used by various roles work on the same data which makes them integrated. These tools also need to access some services for managing the data. The data storage and the common services are provided by a server component of VSTS which is called Team Foundation Server. In this article we will take an overview of Team Foundation Server and services offered by Team Foundation Server. TFS is the heart of VSTS. It pumps the required data and provides required services to the various client applications. It allows all the team members to collaborate with each other. It is a server which incorporates some of the best software technologies created by Microsoft like ASP.NET 2.0, Windows SharePoint Services, SQL Server 2005 etc. TFS is a multilayered server. It is divided in the layers of Data Layer and Application Layer. The data layer and the application layer can be on the same machine if the number of clients is less than 20. 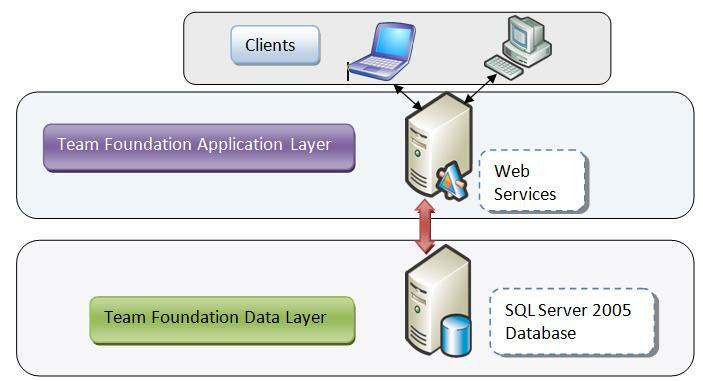 Data layer is implemented in SQL Server 2005. When TFS is installed it creates number of database and tables for maintaining the data of the users, work items, source control and other resources. Being implemented on SQL Server 2005, data layer provides excellent scalability and performance. 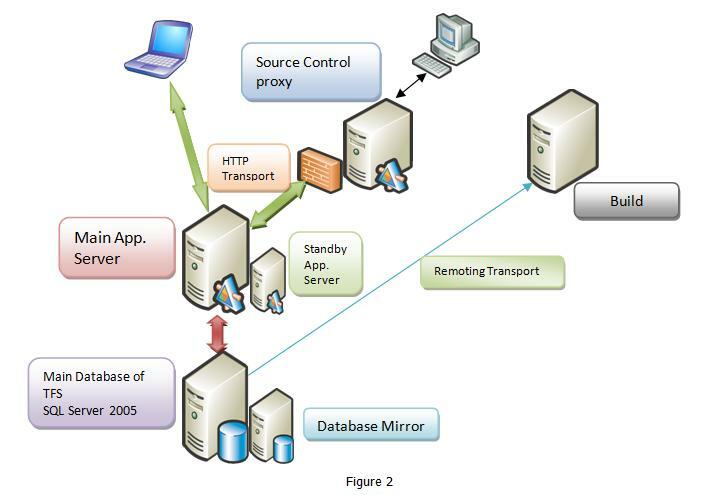 Application layer is implemented through set of services which are available over the network. Most of them are configured as webservices which makes them possible to be accessed even over the Internet. It is possible to create a single tier architecture for installations which do not demand high scalability. It is suggested that for any non-trivial installation the data layer and the application layer should be on different servers to meet the scalability and reliability requirements. For meeting the requirements of teams which are geographically scattered and connected through internet, TFS provides the ability to use proxy to fulfill the requirements of distant users. Although proxy will be caching the source code, main source control where changes are allowed to be stored is where the main installation of TFS is. It is also suggested to have a separate build server since the build activity is very highly CPU intensive. Keeping the main TFS and build server on same machine with frequent builds may hamper the performance of TFS adversely. Fig 2 shows the suggested physical architecture of TFS for any non trivial installation. SCC is the major contributor to Software Configuration Management. SCC in TFS includes normal version control, Branching, Merging, Shelving and Unshelving etc. TFS maintains the source control in SQL Server 2005. By default it allows multiple check-out. We can place locks in such a way that either the locked files cannot be checked out or if they are checked out they cannot be checked in. TFS also supports check-in policies which make it mandatory on the team members to execute certain actions when they are checking in some source code. SCC also works as a point of convergence between the team project and the technological solution. Team project allows for architecture, collaboration, monitoring and control of the project. It is very peripherally concerned with the technology. The technological solution does not involve itself with project management or versioning etc. Every unit of source code to be generated is tagged with a work item. Work item store the management data about the technological entities. Storage and management of work items is done through SCC. For every team project TFS creates a SharePoint portal site. This site contains sections for Process guidance, Reports and documents. It provides appropriate permissions to contributors, readers and guests. Through the process guidance we can learn about the process template that is selected for the project. Various reports provide the health and progress of the project. Clients can have a look at the reports even across the Internet for status monitoring. Work items are tagged collection of data representing some abstract entities like task, bug, Quality of Service Requirement etc. We need to monitor status of each of these entities. At the same time each work item and entity pair will belong to a user at any given moment. The user will work upon the entity like task or bug and then either set the status of the work item to close or re-assign it to some other user for further work on the entity. TFS keeps track of status of each work item and the user who owns that work item at that time. Each developer compiles the application in his / her workspace on the local machine. After compilation the code is checked in the source code control. The checked in code has to be built to ensure its interoperability with code created at other time, maybe, by some other developers. This build process should be carried out periodically to ensure integrity of all the checked in code. TFS allows creation of build at pre-determined time using a component called Team Build. Team build schedules the build script created using MS-Build to be executed at the predetermined time. TFS uses a separate data warehouse to generate reports. There are number of predefined reports as per the process template which are created by default. TFS uses SQL SERVER 2005 Reporting Service to create these reports. Each report indicates either of status of the project, quality of the software which is being maintained, progress of the project. These reports are based upon work items, source code, test results and builds. The status and progress of each is initially stored in the normalized tables in the database. TFS creates the non-normalized entries in the data warehouse for the use of creating reports. Reports Data Warehouse object model allows developers to create custom reports in the form of .rdl files using report designer. These reports can also be made available through the reports site. Team foundation server is the engine that powers Visual Studio Team System. It offers scalable multi tier architecture. It utilizes latest and best technologies like ASP.NET 2.0, Windows SharePoint Services, SQL Server 2005 etc. It offers services that allow collaboration of users and integration of all tools used by various roles configured in VSTS. 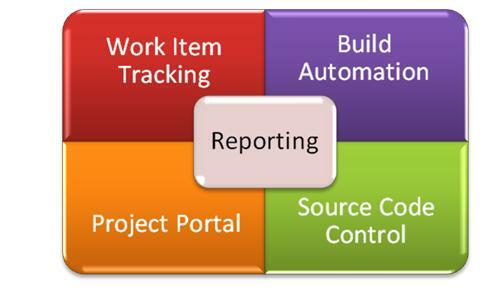 Services it offers are Source Control, Team Build, Reporting, Work Item Tracking and Project Portal.